Abstract: Menstruation was a milestone in the life of an Italian woman, both socially and biologically. Although scholars have explored how fifteenth- and sixteenth-century Italians understood menstruation, there is very little information on how it manifests in visual art. This project seeks to better comprehend Renaissance Italian attitudes towards menstruation and its roles in art through fertility imagery. Introduction: During the Summer 2016 Olympics, Chinese swimmer Fu Yuanhi shocked the world by telling a reporter that she had started her period the night before the race. Digital media company Buzzfeed was quick to translate the story into one of its characteristic image-heavy articles, known as “listicles,” punctuated by photographs of Fu’s characteristic facial expressions and screenshots of supportive tweets in various languages. Author Casey Gueren lauds Fu in the article’s subtitle: “Fu Yuanhi is basically all of us when we’re PMSing.” The interview that sparked such reactions and statements of solidarity is only about thirty seconds long; Fu’s remark on starting her period is literally one sentence. Why, then, did this comment garner so much attention? Another offhand remark on menstruation about a year before Fu Yuanhui’s brief interview created a similar, albeit intensely more negative, buzz online. Donald Trump, in response to his reactions to difficult questions asked by reporter Megyn Kelly during a 2015 Presidential GOP debate, stated: “You could see there was blood coming out of her eyes, blood coming out of her wherever.” This comment ignited massive controversy, leading many to state their support for Megyn Kelly on Twitter and other social media platforms. Here, menstruation is not viewed as a normal function of the body, but as a pejorative marker of femininity and incompetence. Gender equality and reproductive rights have made strides in Western cultures, but natural, bodily functions typically associated with womanhood carry negative connotations. However, a reluctance to openly discuss menstruation does not mean that it lacks representation in public. There are ways to recognize its presence in public imagery, although it is not stated as directly. The image of a smiling woman in an all-white outfit, for example, could easily be understood as promoting menstrual sanitary products when viewed within the context of an advertisement. Menstruation is not invisible or absent from our public visual culture; it is encrypted. Art produced in fifteenth- and sixteenth-century Italy functioned very differently from today in both the private and public spheres, but menstruation is similarly encoded. Uncovering its representation is a matter of framework–asking the right questions and looking at the right type of imagery. 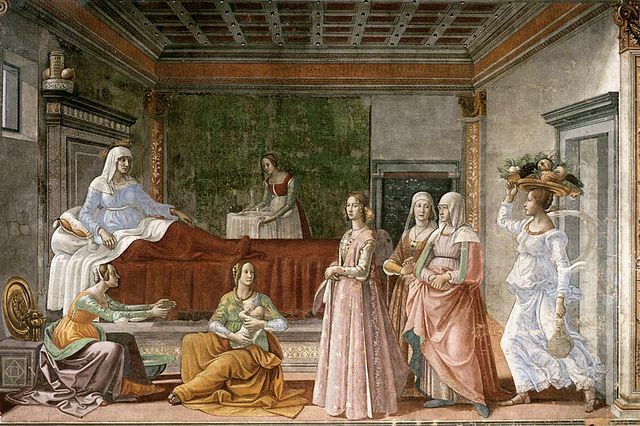 Context, then, is crucial: how was menstruation (as we understand it today) viewed in Italy during the Renaissance, scientifically and socially?